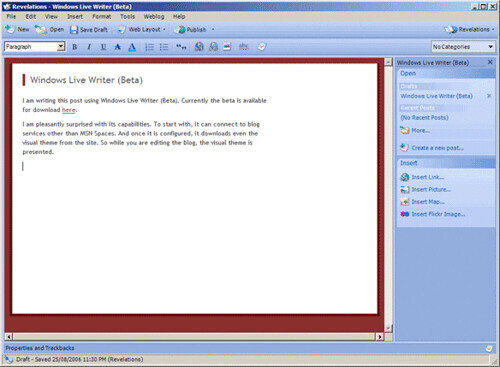 I am writing this post using Windows Live Writer (Beta). Currently the beta is available for download here. I am pleasantly surprised with its capabilities. To start with, it can connect to blog services other than Windows Live Spaces. And once it is configured, it downloads even the visual theme from the blog site. So while you are editing the blog, the visual theme is presented. the tool also exposes a plugin API (currently available here). Quite a few plugins are already available. One of which (flickr4Writer) allows you to insert images from Flicker (and this is the plugin I used to insert the above picture).